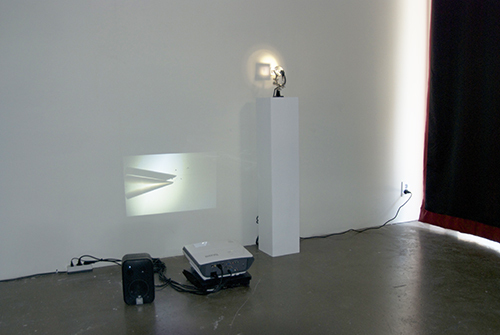 Conical Behavior focusses on the immateriality of video, which lingers in front of us temporarily dependent on electrical devices. 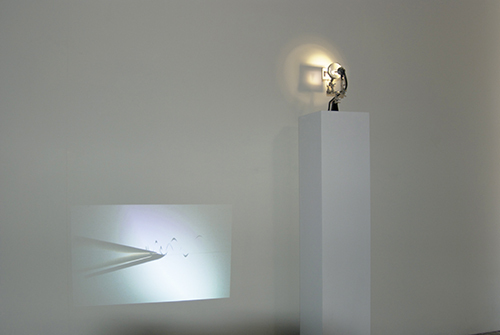 Since its introduction in art, video developed through different formats, resolutions and appartuses. 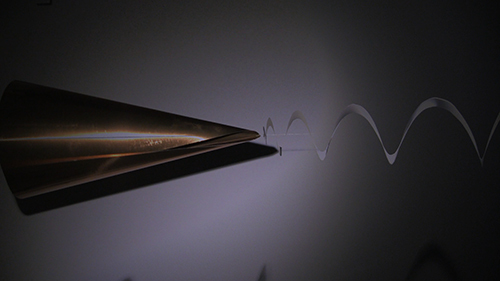 An HD video projection and a still frame from it rendered into a single slide projection, Conical Behavior is inspired by the observation that connecting the point of light source that rays through a lens to a focused surface, it forms a cone. 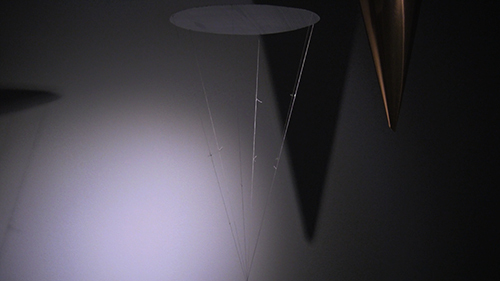 The video alludes to the notions of philosophy and visual perception such asBergson’s inverted cone of memory, light behavior through pinhole and principles of camera and projection. 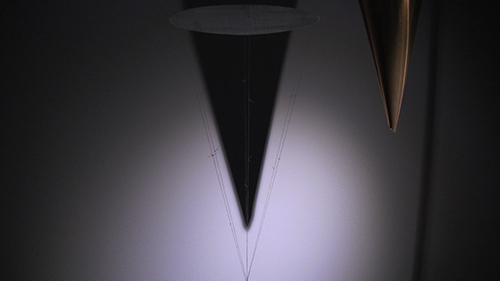 According to Bergson’s inverted cone, when the summit touches our perception of reality, that is when we perceive our memory. At the same time, the subconscious memory oscillates unperceived between different sections of the cone, from the base to the summit. For Bergson, an image is a cross section of continuity of becoming. Different to photography, a video runs over time, at the same time it is a cross section of an edited reality. 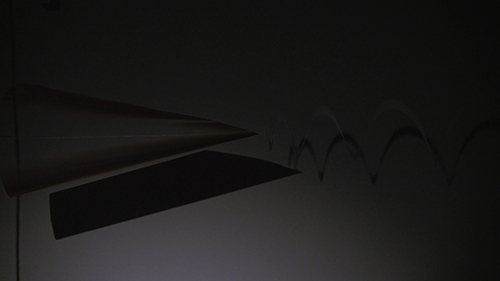 The video in Conical Behavior consists of scenes where moving light and shadow caress the inverted cone as well as two symmetric cones built similar to that of diagram of light through pinhole. The voiceover quotes a paragraph from Bergson’s Matter and Memory (1896), each line told in original French, and subsequently in Korean and English translations. Paired to the projection there is an amateuristically built pseudo-slide projector, which shows a captured image from the video. 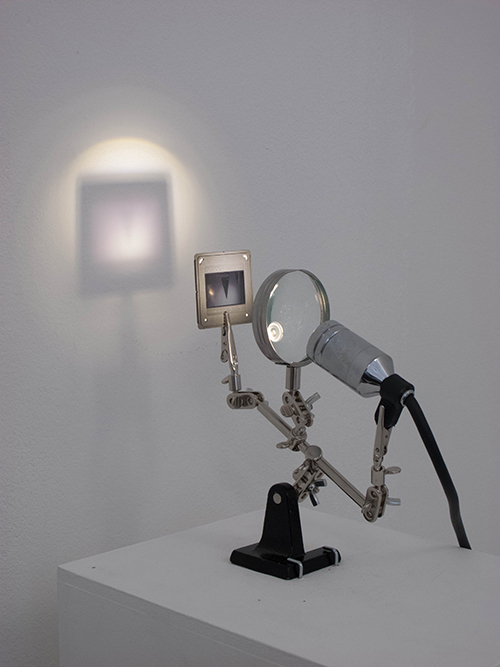 The work suggests the mysterious moment when a reality is captured into a video, then a video captured into a frame, through the viewing of which our perception expands macro- or microscopically. 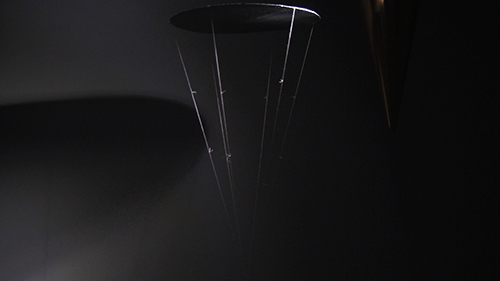 It suggests video as a method to approach the sensation of memory, whose whole and part are not to be divided, which infinitely multiplies, becomes unvisible and oscillates. <원뿔 행동>은 기계에 의존해 한시적으로 점멸하는 영상의 비물질성에 주목하는 작업이다. HD 동영상과 여기서 추출한 한 장의 슬라이드 영사로 구성된 설치작으로, 기계 장치에서 전력으로 발생한 광원으로부터, 렌즈를 통과해 굴절된 상이 맺히는 면까지의 형태가 원뿔이라는 데서 출발한다. HD 영상은 원뿔 모양을 모티브로 베르그송이 말한 기억의 원뿔 도식, 바늘구멍을 통해 빛이 나아가는 형태, 카메라와 영사의 원리 등 철학과 광학 이론에 근거한 몇몇 실마리를 넌지시 제시한다. 베르그송의 도식에 따르면 뒤집어진 원뿔 모양에서 뾰족한 점은 현실과 맞닿으며 기억이 우리의 의식에 드러나는 때다.한편원모양에서점까지원뿔을이루는여러단면사이를,잠재된기억이끝없이 흐른다. 그에게 이미지란 지속과 생성의 한 단면이다. 영상은 사진과 달리 시간을 통해 흐르지만, 동시에 그 자체로 현실을 편집한 단면이기도 하다. <원뿔 행동>의 영상은 베르그송의 거꾸로 선 원뿔, 그리고 바늘구멍 카메라의 도식처럼 꼭지점을 맞댄 두 원뿔의 대칭 형상을 빛과 그림자가 더듬어 가는 장면으로 구성된다. 보이스오버는 베르그송의 저서 «물질과 기억»(1896)의 한 문단을 프랑스어 원전과 국문, 영문 번역본에서 한 문장씩 발췌하여 읽어준다. 한편 그 곁에는 아마추어적으로 조립된 슬라이드 프로젝터가 짝을 이루며 놓여 원본 영상이 도판으로 포착된 한 순간을 보여준다. <원뿔 행동>은 현실이 하나의 영상으로, 영상이 하나의 프레임으로 포착되며 우리의 인식이 거시적 혹은 미시적으로 무한히 확장되는 불가사의한 순간을 제시한다. 이로써 전체와 부분을 나눌 수 없이 끝없이 불어나고, 잊혀지며, 순환하는 기억에 대한 감각과 그것에 접근하는 방법으로서의 영상을 제안한다.